One of iOS 8’s many little conveniences is the ability to (finally!) block numbers from contacting a device. Whether it’s a salesperson, frenemy, or someone you just need a digital break from for a bit, Apple’s new operating system now allows users to limit the communication received from the outside world. If you have people or unknown, annoying numbers that you’d prefer not to see messages or receive phone and Facetime calls from, follow the instructions below. 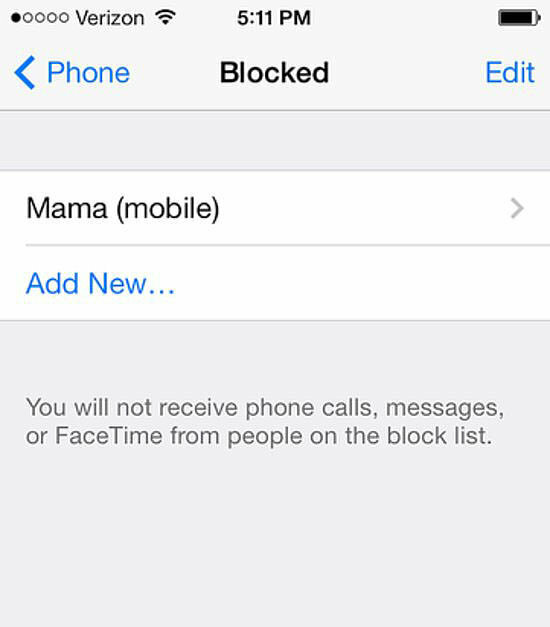 To block someone who has been added to your phone’s Contacts, go to Settings > Phone > Blocked > Add New. The All Contacts window will appear where you can scroll through names to then tap the name of the contact you’d like to block. You’ll be taken back to the Blocked window with the name added to the list of blocked contacts.From Settings, contacts can also be blocked selecting either Messages orFacetime, and then following the above instructions. In instances where you want to a block a number that isn’t stored as a contact in your phone, go to the Phone app > Recents. Look for the number (or name) you’d like to block and tap the blue “i” with a circle around it to the right of the number. Scroll down to the bottom of the contact card that appears and select “Block This Caller.” The message “You will not receive phone calls, messages, or FaceTime from people on the block list” will appear with two options: Block Contact or Cancel. Hit Block Contact to add the number to the big, bad blocked list. Block from Messages by selecting the message thread with the contact and tapping Contact in the upper right corner. Select the information icon, and proceed with the same instructions as in the Recents tab in Phone. In Settings go to Phone > Blocked, where a list of blocked contacts and numbers will appear. Tap Edit in the top right hand corner. Then, tap the red delete button to the left of the name, which will cause a red unblock button appear. Select it, and the contact is restored to unblocked bucket, with all rights, privileges and honors appertaining thereto.From Settings, contacts can be removed from a blocked list by selecting either Messages or Facetime, and then following the above instructions. Unblock the contact via Messages by selecting the message thread with the contact, and tapping Contact in the upper right corner. Select the information icon, and proceed with the same instructions as in the Recents tab in Phone. Will The Contact Know They’re Blocked? Short answer: no. But a perceptive friend might notice that they can never get a hold of you. When someone in your blocked list calls, they’ll be immediately sent to voicemail. Any message left in voicemail will be put in a separate folder called “Blocked Messages,” to which you can listen. Take note, blocking contacts goes one way, meaning you can still call, text, or FaceTime the numbers you’ve listed in Blocked. So if the blocking is also to limit yourself from communication with a certain person, better go ahead and delete their number completely from your phone.